Incredibly light and amazingly thin, BenQ's Joybook Lite U103 is the ultimate laptop for those who put a premium on easy mobility without usability compromises. 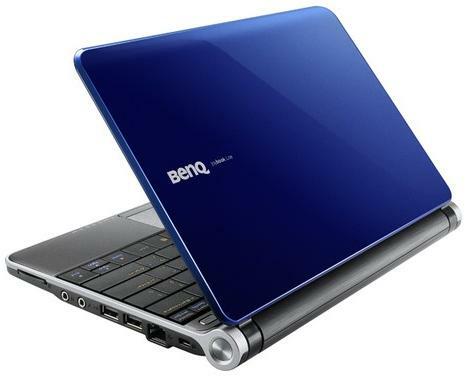 Even at its thickest point—still less than 1”—the U103 is slimmer than most netbooks. What's more, using it is as much a delight as beholding its sleek form. Here, finally, is a laptop made for mobility—and made to amaze. The Joybook Lite U103 trims away unnecessary bulk, while preserving the advantages of larger laptops. At 1.1 kg, it's barely noticeable when carried, and its exquisitely sleek form, never more than an inch in thickness, is sensationally stylish. Despite its diminutive proportions, the U103 packs plenty of battery life at a mighty 8 hours with a 6-cell battery that provides 4.5 hours of power even with a mere hour of charging. The U103 is a stunner in either the Arctic White or Ocean Blue color scheme. The nearly (92%) full-size flip-top keyboard provides comfortable text entry with a minimum of typos, and is futuristically styled with high-contrast Arcturan orange text on the stark black keys. You'll also find a multi-touch touchpad that makes navigation and manipulating onscreen content more natural and intuitive—and a sheer delight. With a high-resolution (1024x600 or 1280x720) widescreen display and SRS TruSurround HD™ & SRS CS Headphone™ high-definition audio, the U103 is made to give you a superb viewing and listening experience. What's more, while based on Intel's new second-generation netbook platform, the U103's ultra-quiet design allows you to enjoy smooth media playback and snappier overall performance without distracting noise. Like a super-efficient butler, the U103 saves you time and streamlines your tasks. It comes with the acclaimed new Microsoft Windows 7 OS, and dual-drive support—which means you can make use of both a regular hard disk drive with huge capacities up to 500GB, and a solid-state drive (optional) with their shock resistance and super-fast access speeds. Whether you wish to connect to a printer, mobile phone, or a friend on the other side of the world, the U103 has got you covered, with 3 USB ports, 4-in-1 card reader, 802.11b/g/n WiFi, Bluetooth 2.1 + EDR (optional), and HSUPA cellular data modem (optional). For speed and convenience, the U103 serves up what you need.